In a short prom dress from Simply Dresses, you’ll be chic and comfortable for your big night. You’re sure to sparkle at prom in a stunning sequin semi-formal dress or breathtaking jewel-embellished short formal dress. Shop this selection of the latest styles and hottest trends in junior prom dresses, cocktail party dresses, and short formal dresses for prom. Whether you're looking for knee-length or mini dresses, strapless or halter-top dresses, fitted or full dresses, you'll find just what you are looking for at Simply Dresses. Why Should I Wear a Short Dress to Prom? Available in a variety of styles, short prom dresses are comfortable, versatile, and often more affordable than their long counterparts. Prefer a classic style for your short prom dress? 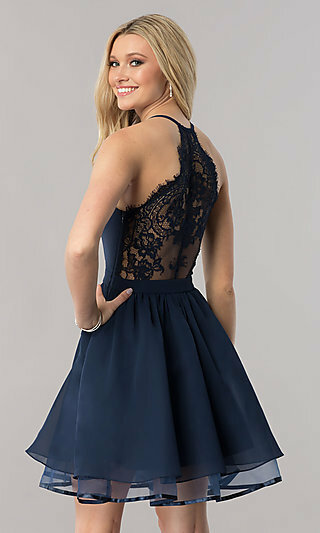 Sophisticated lace semi-formal dresses, elegant cap-sleeve short formal dresses, or lovely long-sleeve cocktail party dresses will give you a chic look for prom. Want to look captivating? Check out the gorgeous open-back short dresses for prom or the alluring illusion cut-out dresses! Or maybe you prefer to be the trendsetter in a short two-piece dress. 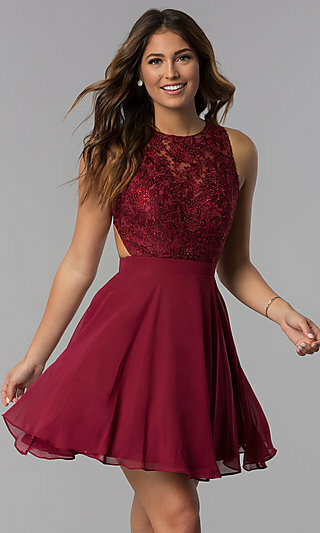 Whether you need a short prom dress with a v-neckline or a short formal dress in a popular color like navy blue, burgundy red, or mauve pink, you’re sure to find your perfect style. These fabulous short prom dresses can give you that A-list celebrity look in bold colors or trendy prints at affordable prices. Shop all styles of short dresses from short prom dresses to sleek cocktail party dresses.This assortment of short prom dresses includes short formal dresses in an array of designs, fabrics, and colors. Get your ideal look for prom or junior prom with a short formal dress from Simply Dresses. Fashionable and flattering, the short prom dress of your dreams can be found right here.